The sun was shining and it was mild. Then it rained hard for 13 seconds before pounding our house with hail for 37 seconds, after which, snow lightly fell for almost 3 minutes. Then the sun re-emerged and the house is hot. Doors and windows opened for fresh air. One direction, gray skies. The other? Blue. Beware the Ides of March. And the weather, too. “SUGAR SNAP PEAS.” THE STILL-LIFE. But in related happy news, I picked up my Sugar Snap Pea seeds (the gardener’s candy) a couple of days ago. I also threw caution to the wind and grabbed some purple stock and yellow pansies to inhale deeply). I was thinking, as I got my breakfast the next morning, how much I LOVE that new-plant green color! And in 23.02 seconds flat, I had assembled this “ode to spring-green” still-life from things within my reach. Even the lowly head of grocery-store iceberg lettuce has its merits, I guess. This is the green of new life, hope and the end of a long winter. After every winter, spring will eventually come to stay. This much I know is true. Come along, lovely spring. Be sweet and don’t make me wait. I want you, green, badly! 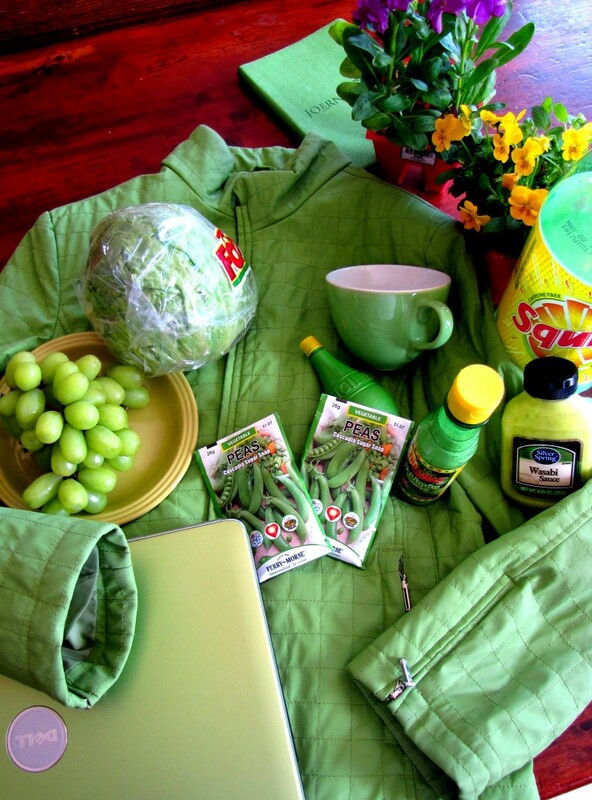 The still life: my jacket from Stef, a green journal, a green plate, giant green grapes, lettuce, lime salt, sugar snap pea seeds, Wasabi sauce, lime juice, Squirt, a mug, stock, pansies and my computer—which is actually waaaaay more spring-green than it looks here! Do you own anything that isn’t green?